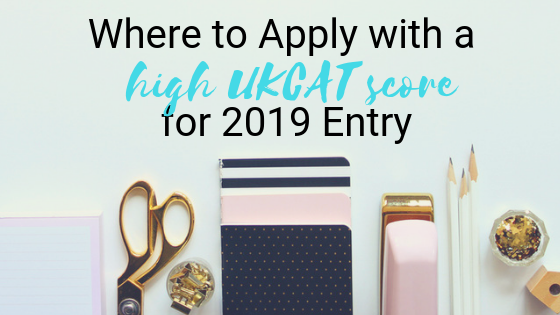 In 2019, the UKCAT was renamed UCAT, so if you’re applying for 2020 entry or beyond, you will sit the UCAT. You can read about the switch here. Scored over 680 in your UKCAT and unsure where to apply? This blog explores your medical school options if you have a great UCAT score! If there were a competition for where a UKCAT score is most important, Newcastle would likely take the gold. Newcastle’s application system is very simple, but by no means easy. Applicants are first screened to ensure they meet the medical school’s academic requirements, and then are ranked on their overall UKCAT score. A set number of applicants from the top of this ranking are then invited to interview. The SJT is not used. The personal statement and reference are not scored – in fact, interviewers are not given access to them before your interview! This means an invite to interview is decided almost entirely by your UKCAT score. The threshold score needed to secure an interview varies year on year, however in most years applicants have needed a UKCAT score in the top 20% of those sitting the test. For 2018 entry the threshold score was 645, and so just above average. However this is quite an exception, as for 2017 entry this was 667 and for 2016 was 683. Where this year’s threshold will be is hard to say, but if you find yourself in the top 20% of scores, then Newcastle would be a good option, with an interview almost guaranteed! If you are not in the top 20%, Newcastle is certainly an option, as we can see from the last few years – but there is still some risk involved. Once you get to interview, offers are decided entirely by performance at interview. The key thing to remember with Edinburgh’s application system is that they don’t interview. They are the only medical school that doesn’t. If you don’t like interviews then this might sound like good news, however because of this it means the other elements of your application must be really good. In previous years each element has been allocated points, with applicants ranked on total points. It is likely Edinburgh will continue with this system. Your UKCAT score makes up 20% of the application system. All applicants are ranked on their UKCAT and the ranking is then divide into octiles, with each octile allocated a set number of points (the best receiving 8, the second best 7). Academics makes up the largest component, 50%. This is determined using GCSEs and predicted grades, to score up to 20 points. Your personal statement and reference are then scored using detailed guidelines to contribute an additional 15%, or 6 points. The final 15% comes from the SJT, giving another 6 points. This is quite a heavy weighting for the SJT, more than most other medical schools. Once all points are allocated, applicants are ranked and offers made based on the rank order. You can find details of points allocation here. So what do you need to stand a good chance at Edinburgh? This is a very difficult question to answer. Because there are no interviews, we find that candidates who do very well on all components of the application still find it hard to gain an offer, it’s just that competitive! In terms of points, for 2016 entry the lowest score given an offer was 31 out of 40, and 30 for 2015 entry. For the UKCAT, Edinburgh comments “no applicant is eliminated from selection on the basis of UKCAT score alone” this means there is not cut off, however Edinburgh go onto comment that 75% of offers made are to students into the top two octiles. If you look at the average score of those receiving an offer for 2016 entry, this was 705.5! This means that the majority of those receiving an offer will have a very high UKCAT score, in about the top 20% of applicants. The lowest UKCAT score given an offer for 2016 entry was 582.5. But with roughly 13 applications per place, there is very little room for weakness with an application. To stand a good chance of receiving an offer one would need to do very well in nearly every part of the application process. In theory, amazing academics and personal statement could make up for a low UKCAT (this was likely the case with the student who scored 582.5), however since most applying will have a high UKCAT this would make a very risky choice even riskier. In terms of academics, Edinburgh comments “The average A level applicant is offering 6A* at GCSE and the top one third (around 350) between 8 and 11 A*.” You can find out more here. At Barts, UKCAT makes up 50% of selection for interview. The UCAS tariff score makes up the other 50%. Your UCAS tariff can be calculated from your A-Level grades, either predicted or achieved. This can be calculated on the UCAS website, but to give you an idea – an A* is awarded 56 points, an A 48 points etc. Barts also uses a cut-off for your tariff of 144. A low UKCAT score can be made up for by a high UCAS tariff score, and vice versa. However, Barts does also use a UKCAT cut-off score, but a relatively low one – anyone under the third decile (in the bottom 30%). In fact, the lowest score receiving an interview for 2018 entry was actually 595! To gain an interview with a low UKCAT like this, you will need a high UCAS tariff, 584 in this case. Barts has released some useful statistics from last year that give you a good idea of what UKCAT scores and UCAS tariff were invited to interview last year. The personal statement is only discussed at interview, where the SJT is also incorporated into your score. Since Barts focuses heavily on A-Levels, the more subjects you are studying the better. If you have several A*’s predicted, are studying more subjects, or doing an EPQ, this improves your chances. So, in short: Barts has a cut off that needs to be met, but this is just part of their criteria, so getting above this doesn’t equal an interview. If you meet this, then your UKCAT is combined with your UCAS tariff and those ranked highest overall get interviews. So in theory you can get in with a low UKCAT, but the vast majority getting an interview will have a score in the top 3rd of applicants (if not then your UCAS tariff should be super high to compensate). At Nottingham you are allocated points using your UKCAT and academics. Your GCSEs in Biology, Chemistry, Physics, Maths, English Language and best three other subjects will be scored. A*’s are awarded 2 points and A’s 1 point, to give up to 16 points. You will also be allocated points based on your UKCAT, scored for each cognitive section, so you will be given points for Verbal Reasoning, Quantitative Reasoning, Abstract Reasoning and Decision Making, not your overall total. For each section you are scored as follows: 801-900 = 9 points, 701-800 = 8 points etc. This means someone scoring 601 in Verbal Reasoning will be given the same number of points (7 in this example) as someone scoring 700! The SJT is also awarded points, using the following system: Band 1 = 4 points, Band 2 = 2 points, Band 3 = 1 point. Applicants who score a Band 4 will not be considered further. The four cognitive sections together with the SJT give a maximum of 40 points. This is added to the 16 points from your academics, and those with the most points continue to the next stage. This means the UKCAT has more weighting than academics, and the SJT plays a large role. Those who make it to the next stage will have their personal statement and reference assessed, where up to 16 additional points can be added to the previous score. The applicants with the most points overall from academics, UKCAT and personal statement are then invited to interview. Since there are many elements to Nottingham’s application system, there is no ‘cut-off’ UKCAT score, so it is hard to advise what a suitable UKCAT score would be. But to give you a good idea of what region you need to be in, for 2016 entry successful applicants had an average UKCAT score of 697.5! If your score is lower than this, Nottingham is still a possibility, it just means you will need some good GCSEs, a fantastic personal statement and hopefully a Band 1 in the SJT. For 2015 entry, successful candidates scored on average 82% of the available points. But keep in mind the SJT is weighted more heavily than previous years, and so it is hard to comment on how many points are needed for interview.